The Well of Souls (بئر الأرواح‎ Bir al-Arwah) sometimes translated Pit of Souls, Cave of Spirits, or Well of Spirits is a partly natural, partly man-made cave located inside the Foundation Stone under the Dome of the Rock shrine in Jerusalem. Also known in Christianity and Judaism by the time of the Crusades as the Holy of Holies. Panoramic view of the Well of Souls, entrance and the Mehrabs of the cavern. The name "Well of Souls" derives from a medieval Islamic legend that at this place the spirits of the dead can be heard awaiting Judgment Day. The name has also been applied to a depression in the floor of this cave and a hypothetical chamber that may exist beneath it. The cave chamber is roughly square, about 6 meters on a side, and ranges from ≈1.5 to 2.5 m (4 ft 11 in to 8 ft 2 in) high. Lady Burton described exploration (1871 CE) of the Well of Souls as tourists: "A flight of fifteen steps takes us into the cave under this Rock. This feature has been immensely written about. I shall content myself with saying that Captain Burton holds it to be the original granary of the corn threshed, or rather trodden out, upon the plain on either side, and winnowed from the Rock. If the latter prove to be the great Altar of Sacrifice, the cave will be the cistern for the blood which ran off by the Bir el Arwáh (Well of Souls) into the Valley of Hinnom." Prayer niche dedicated to Prophet Abraham (Ibrahim) in the northern corner of the chamber. The ceiling of the cave appears natural, while the floor has been long ago paved with marble and carpeted over. For Christians, the site is known as the Holy of Holies (alluding to the former inner sanctuary within the Temple in Jerusalem) and is venerated as a possible site of the annunciation of John the Baptist, since Luke says it happened in the Temple. Prayer niche dedicated to Prophet Khidr () to the north-west corner of the chamber. Both Jewish and Muslim traditions relate to what may lie beneath the Foundation Stone, the earliest of them found in the Talmud in the former and understood to date to the 12th and 13th centuries in the latter. The mehrab dedicated to King David (Dawud), is located in the southern corner of the chamber. It is a trefoil arch supported by miniature marble twisted-rope columns. The mehrab dedicated to King Solomon (prophet Suleiman). According to Goldhill this is one of the oldest mehrabs in the world, dating back at least to the 9th century. Some even suggest that it dates back to the 7th century and to the time of 'abd ul-Malik ibn Marwan, builder of the Dome of the Rock — making it the oldest in the world — but this is disputed. It is a shallower, but ornately decorated, prayer niche dedicated to Solomon. At the center of the ceiling is a shaft, 0.46 meter in diameter, which penetrates 1.7 meters up to the surface of the Stone above. It has been proposed that this is the 4,000-year-old remnant of a shaft tomb. There are no rope marks within the shaft, so it has been concluded that it was never used as a well, with the cave as cistern. The ceiling of the cave appears natural, while the floor has been long ago paved with marble and carpeted over. Entrance to the Well of Souls is at the southeast angle of the Foundation Stone, beside the southeast pier of the Dome of the Rock shrine. Here a set of 16 new marble steps descend through a cut passage thought to date to Crusader times. On the way down, bedrock masses project in towards the stair; the one to the right is called "the tongue". The floor of the cave during a recent (April 2015) carpet changing. The site of Well of Souls has never been subject to an archeological investigation and political and diplomatic sensitivities currently preclude this. 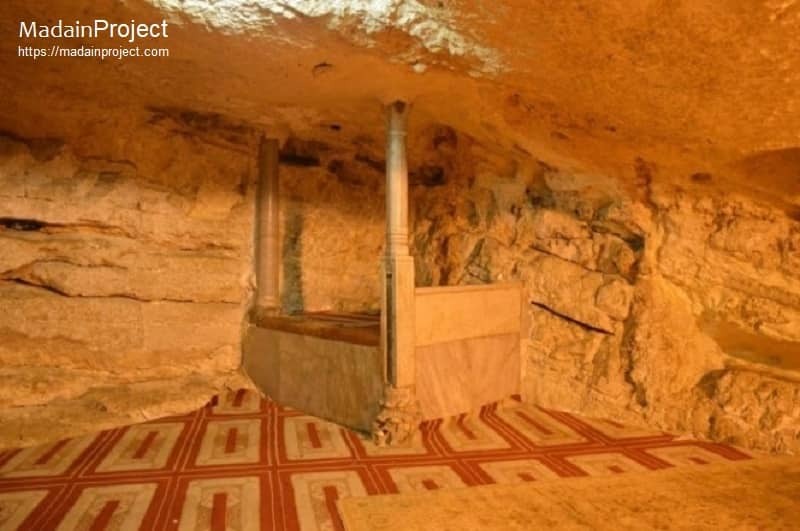 The Cave of Souls is located directly underneath this exposed bedrock, directly under the Dome of the Rock — known as the Foundation Stone — is the spot upon which Jewish tradition says Abraham prepared to sacrifice his son Isaac and from which Islamic tradition also indicates Muhammad ascended to heaven. Nasir-I Khusraw (11th century), Diary of a Journey through Syria and Palestine, pp. 49-50; translated (1888) by Guy le Strange. Burton, Lady Isabel (1884, 3rd edition), The Inner Life of Syria, Palestine, and the Holy Land: From My Private Journal; London: Kegan Paul, Trench and Company, pp. 376-377. Maraini, Fosco (1969), Jerusalem: Rock of Ages; Photography by Alfred Bernheim and Ricarda Schwerin; Translated by Judith Landry; New York City: Harcourt, Brace and World, Inc.
Burton, Lady Isabel (1884, 3rd edition), The Inner Life of Syria, Palestine, and the Holy Land: From My Private Journal; London: Kegan Paul, Trench and Company. The Mysterious Well of Souls, the Holy of Holies". Tourists in Israel. September 4, 2016. Retrieved December 6, 2018.